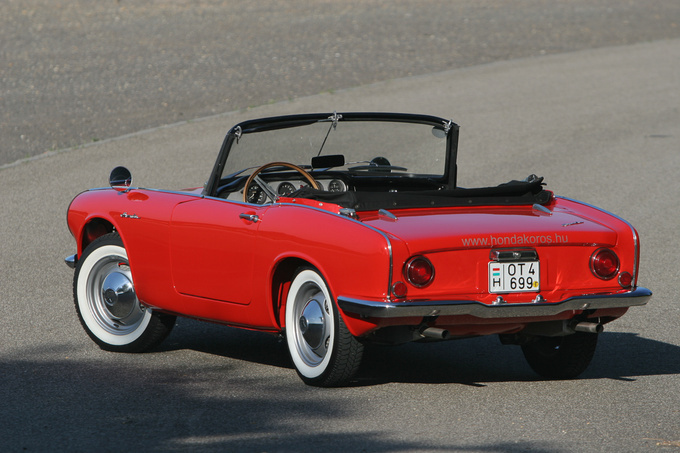 The Honda S600 roadster sparkles in the dense mass of sport cars from the 60’s like a Swarovski thrown amidst the pebbles on the beach. The fact that it's dwarfed by the rest doesn't diminish its charm at all. From a technical point of view the car you see here held up a finger to all the others when it was first presented to the world in 1963. Up to that time Honda had only made motorcycles but, mind you, by that year every second bike sold in the US wore their logo. Their really-really first car was, in fact, a truck, the T360. Not a very exciting start you'd say. But that truck had a twin-cam engine that could rev to 9000rpm – now that's something. See, in those poverty stricken years vehicles capable of transporting goods were in more need in Japan than passenger cars, so it was a logical move from Honda to produce a commercial vehicle. But just four months later the S500 roadster with an engine based on that of the T360 truck was introduced. 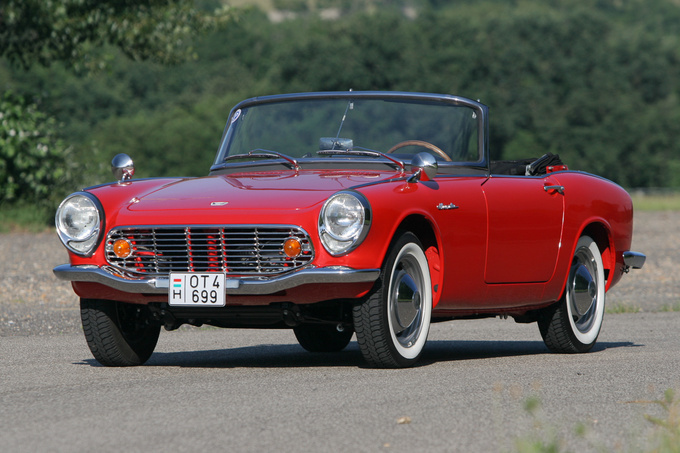 By 1964 the small roadster's engine was enlarged to 606cc and it was renamed the S600. We've arrived to our car here. Had the S600 been introduced in the 80's, the world would have looked at its prowess with awe. But it came a full two decades earlier. 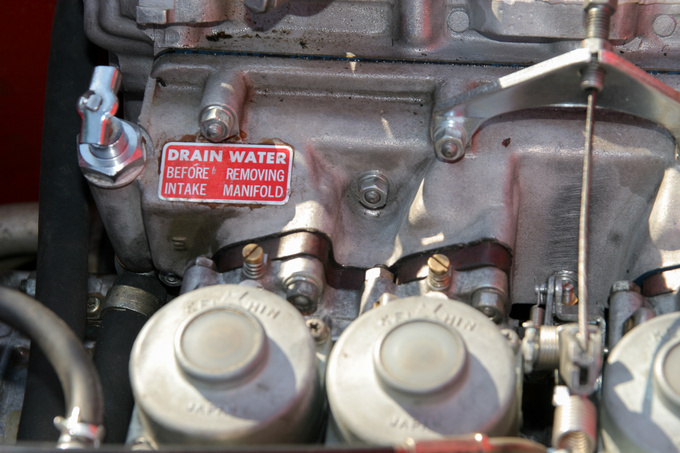 In those times many a sports car had an all-iron pushrod engine with a single choke carburettor. If the maker decided to put two of those on the motor, it already called the product a high-power version. Of course there were more sophisticated cars in those times too, but the fact remains the same: when it arrived, the S600 was a breath of fresh air. 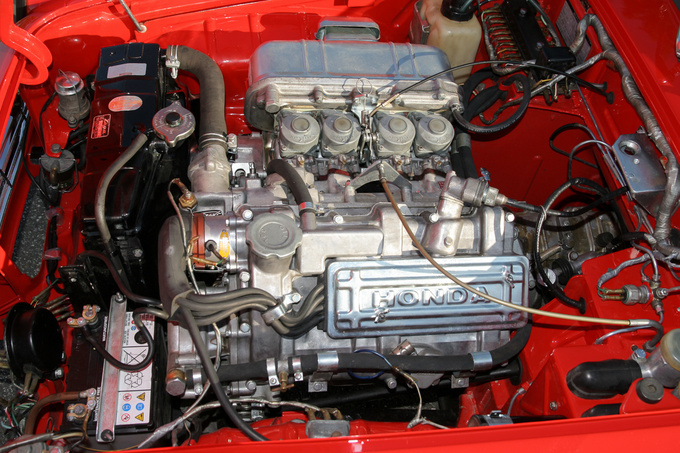 It had two camshafts at the top of its small engine block, which in turn had hemispherical combustion chambers that were fed by a carburettor each, making a total count of four (SU-derived) Keihins. Its crankshaft could be disassembled and it rotated on needle roller bearings at each main journal. There was a power of 57 PS to be had at 8500rpm, man! Just make a quick calculation – this gives you almost 100 PS/litre which is a number that rings nice even today. 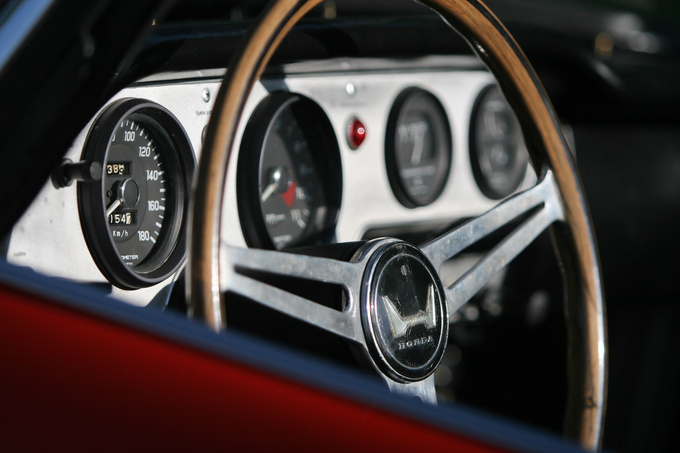 Owners and testers of the time had said that the engine could easily take revs above 11,000rpm without any trouble. Oh, yes, it was a gem. Slanted at 45 degrees the engine was completely made of aluminium, and the rear suspension of the car was also a work of art. There was a four-speed gearbox attached to the differential, but this diff wasn't located where you'd expect it to be: it was nearer to the centre of the car, being approximately below the inner elbows of the passengers. The half-shafts extended outwards and from their ends the power was transmitted to the wheels by a chain on each side. 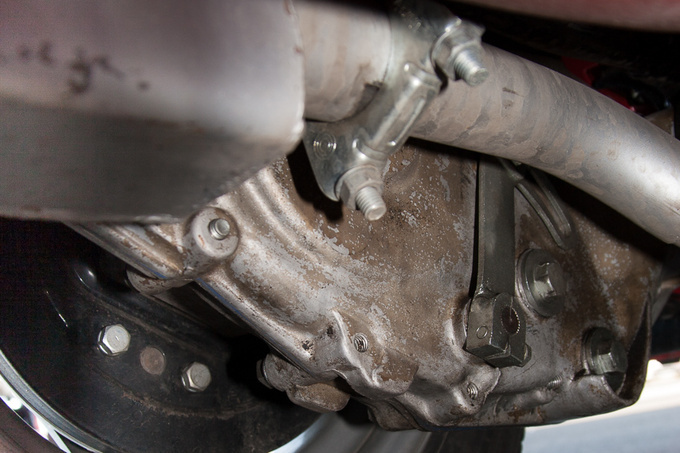 This was basically a longitudinal arm suspension, but these arms made of aluminium doubled as enclosed chain housings not much unlike the ones used on Honda motorcycles of the time. Try to think as Soichiro Honda did. 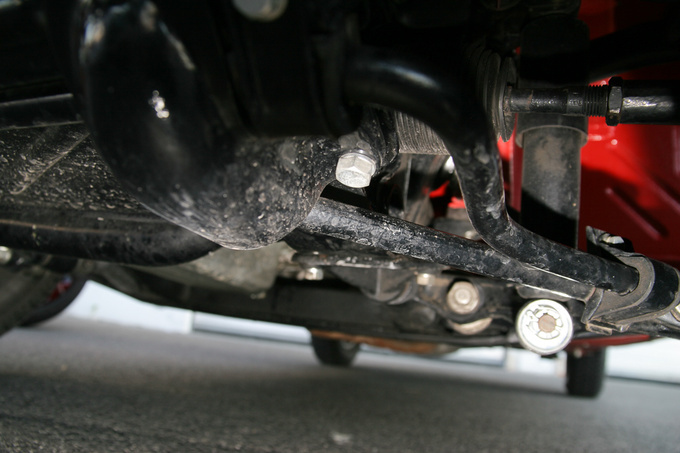 In the beginning of the 60's designers were desperately looking for new solutions for the rear suspensions of cars so as to get rid of the heavy live axles that spoiled the cornering abilities on bad roads because of the large unsprung weight. The aluminium chain cases in the Honda were light; the chains in them were running in oil bath that protected them from dust, mud and rain, so they lasted long. By having a differential located so much towards the front Honda could concentrate the swing masses towards the middle of the car making it less prone to oversteer. Had he used a longer prop shaft and a normally located diff, the setup would have necessitated installing dry half-shafts in the system with either universal or Rotoflex joints at the ends. Heavy and complicated stuff, not necessarily better than the aluminium chain cases. But this construction had an unforeseen problem that showed up as the newer tyres got more and more grip each year. With the new rubber traction was much better than when the original design was put on paper, so when the S600 was thrown in a corner really fast, the chain cases would distort and kick back in the worst moment, severely unsetting the back of the car. With the limited power of the S500 this wasn't a real problem, but it turned worse with the stronger S600 and would have made spirited driving of the 70 PS S800 a real nightmare on dry roads. So in that final version Honda gave in and replaced the brilliant but flawed system with the old-fashioned (and dreaded) live axle. But there weren't many who knew about this small problem at the S600's debut. When men with names like Enzo, Colin and Ferruccio saw this little car they all must have had passing dark thoughts. To prove that the S600 wasn't born out of mere accident Honda unveiled its first Formula-1 car, the RA271 in 1964, which was totally constructed in house – in those times only Ferrari and BRM were capable of such a feat. This out-of-nowhere race machine then came first in the Mexican GP and brought home a number of other trophies in the months coming. 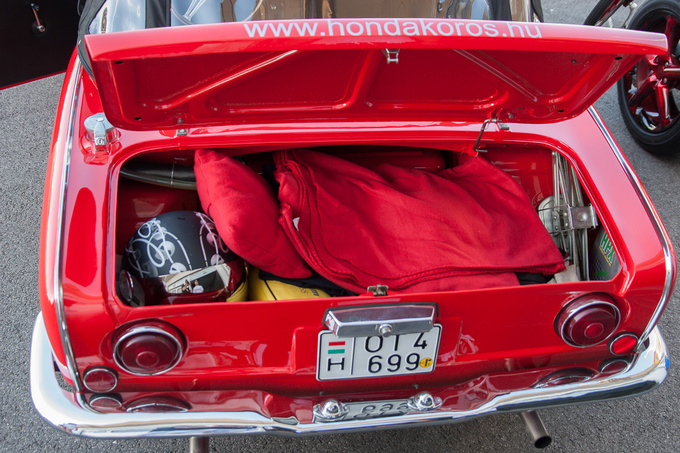 He took the car with the highest bid but before he started to organize its relocation to Hungary the auctioning company found a second one. Not knowing better he bought that one too, drove to Switzerland and got both of them to Békéscsaba, his home town. András suddenly found himself with not one but two old Honda wrecks, one of them from 1964, the other from a year later. Luckily, the part that was missing from one of them could be found on the other so he had high hopes of combing together an easy project. It was out of question to put both cars back on the road – he had only one set of most of the parts in the end. A decision had to be made: which one should escape demolition? He decided to fix the latter because it had a production date coinciding with his birth year. Who needs a door trim more complicated than this? Surprisingly there wasn't much corrosion on the body of the car, bolts were undone without effort and the panel-beater had to be called in only to fix the front section of the car which was involved in an accident. 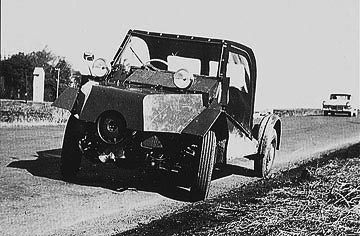 While the newer car was being worked on, the other was also partially put together to act as a jig for making the structure of the canvas roof. Lots of items had to be bought abroad. This is easy to say but with a rare car of this age such a task verges on the impossible. Lots of searching and red-eyed internet-watching followed, hugely expensive boxes were constantly arriving from GB, the USA and even Australia but finally it all came together. No matter how small the car is, the amount of work to be done on it was big. 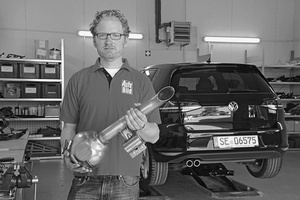 The Honda Körös dealership's own mechanics worked on it mostly, often to late hours with such tender care that only newborn babies receive. The gearbox and the rear axle received only the necessary cleaning and TLC but the engine proved to be a real headache. One of them was worn out, the other in pieces – luckily the cylinder bores of this one were well within the wear limits, it was only the head that was cracked. After renewing the cylinder head of the other engine they chose the best four pistons out of the existing eight and thus they put a virtually new engine together. Because of the complexity of the design there were some major holdups, but in the end they had a really good compression and lubrication. Let's turn the page. Imagine yourself attending a track day event organized by your magazine. You have a Nikon in your hand trying to document the event when, amongst dozens of tuned cars waiting for their slice of time on the Hungaroring, you notice this red thing. This is a car I had only seen in books until I turned thirty, and even after that the only glimpse I got in real life was on the Seiberer Bergpreis in Austria, which is a hill-climb time-keeping race for small cars. I attend that race almost every April for the Steyr-Puchs, especially the TR's which make a playground out of the curvy road. It was just once that a car like this – a later S800 coupe in black – was driven there. I stood there dumbfounded, because I never saw a jewel of a car like that before. Since then I've been to Goodwood FoS and the Revival, the Le Mans Classic, the Cars and Coffee in Irvine, USA, but all the wonders I saw at those events weren't able to erase the little Honda's picture from my memory. “What the heck...,” I was thinking, but then I noticed a man with a collection of suspicious car keys in his hand. He smiled and tossed me the ring. Now don't forget that, apart from its value of 20-25,000 Euros, this is an incredibly rare car in Eastern Europe, plus dozens of technicians worked on it for months. If anything breaks it's a disaster. “Beware, you really have to rev the engine otherwise there's no power at all! If you get the hang of it, it's real fun!” the man continued and he tossed me the keys above the car. This chap was András. The bloke with all the photographic equipment hanging from his neck was yours truly. In one moment I was pinching myself at seeing a car like this, feeling very lucky to be able to take some shots of the emerald of an engine when one of the technicians opened the bonnet for the admirers, the next instant I had its keys in my sweaty palms. Such things don't happen very often, do they? I shook my head and made a dive for the driver's seat. I had the engine going in an instant, grinning stupidly as I was gently pumping the accelerator to get the oil around the journals. I still couldn't believe my luck. 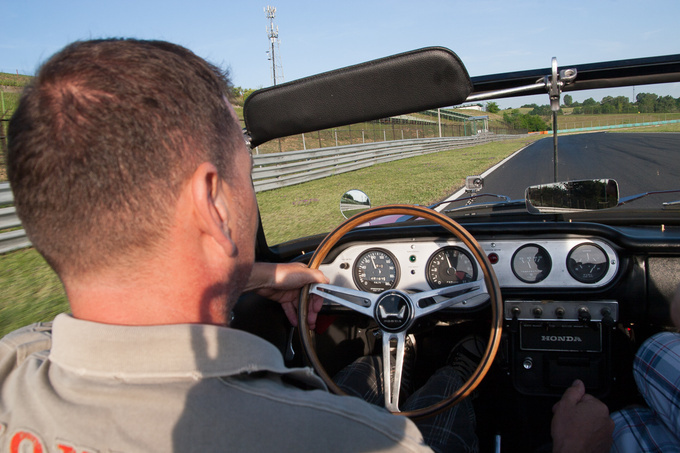 But there was a good drive waiting: I took off for a run around the perimeters of the Hungaroring circuit. This car is tiny even according to Fiat 500 standards but if you somehow manage to squeeze your body in it, it proves to be quite habitable. 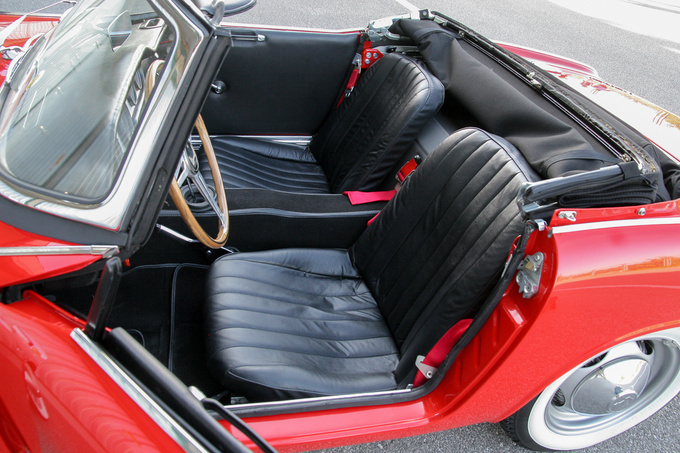 For example an MG Midget is more cramped, although it's much bigger on the outside. The trick is that the engine in this one takes up only a very small space. It didn't take long to notice that if I drive it like I would a normal car from the 60's, we will not be making any progress at all. The engine is exceptionally small, so you can't expect any useable torque from it down low. I had a Honda CB350 Four motorcycle from 1973 which really craved for revs, I sometimes had 12,000 on the meter, but even that was a torque monster compared to this car. 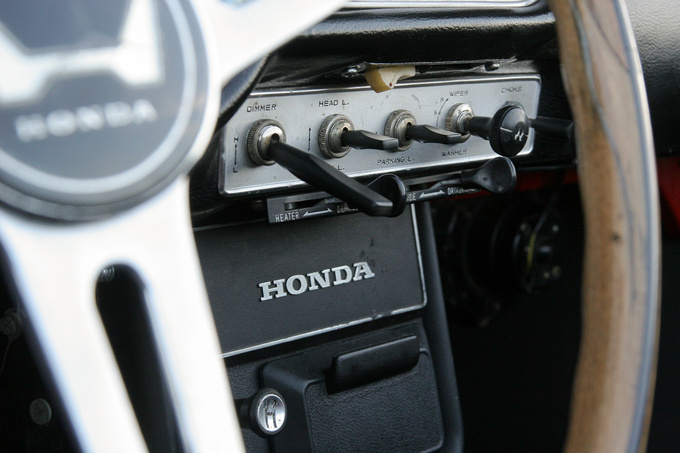 By the way: the engine of this car has no relation to any motorcycle's, since Honda hadn't started producing four-cylinder motorbike engines until 1969 for public use. Well then, let's push a bit harder. The rev needle crept past the 4000 line, then came 4500, 5000... and all of a sudden, magic happened. Until then the exhaust pipes emitted a baritone thrum hinting at a much bigger motor, but here the note changed to a wail and somewhat later, a scream. The long pedal turned into a tap to adjust power with, the speedometer's needle started a rapid climb and I finally felt the push in my back I was expecting so much. I forced the little engine to 9000 and shifted as András instructed me – what a joy. The sound that this four-cylinder makes when stressed is a carbon copy of race engines of the time. 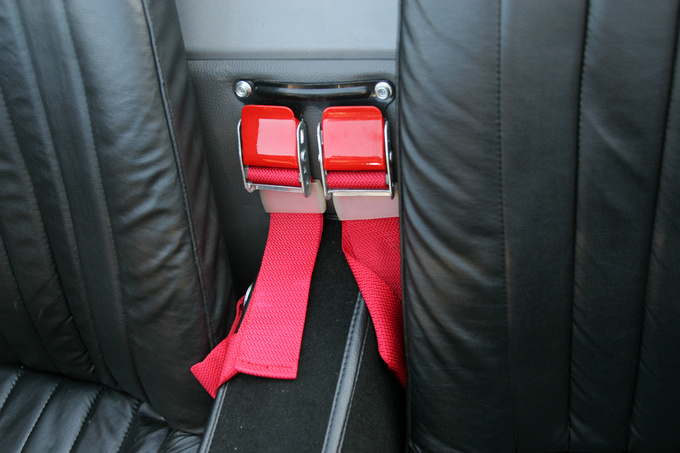 You'd rarely be able to experience such in a road car. And the way it carries out the act makes you believe you're doing at least 200, although the reality is barely half of that. A wonderful little illusionist this Honda is. The engine is an utter delight but the gearchange needs some sorting yet. First is notchy, second comes easily then it is tough to find third again, but fourth gear is like hitting homerun. If you succeed in finding all the speeds at the right moment, the Honda turns into a proper, 1.5-litre roadster from the 60's with a road holding of something from a decade later. 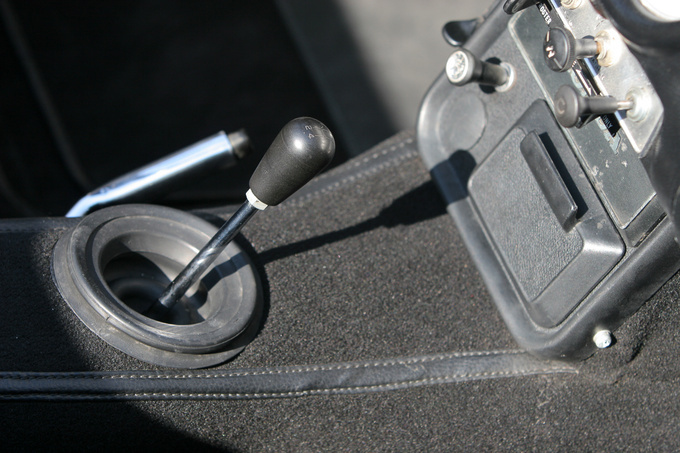 Steering is really light due to the 700 kilogram weight, you just have to think of the clutch pedal and it has already disengaged, even the brakes are truly effective. An unexpected bonus is the fine suspension and little roll in corners: the springs are quite soft but the anti-roll bars are stiff. This car is like a mechanical jury: if your driving abilities are below average it becomes a nuisance to drive. But if you truly believe in the indestructibility of Soichiro Honda's machines and really give it the head, it lifts you to heaven. Only then you do get the speed and the fluidity that the car hints with its looks. The more you press it the more of a screaming devil it becomes. And you tame it with a single finger. When accelerating the cacophony of finely adjusted valve-train clutter blends in with the induction and exhaust noises, making a fine cocktail of larger-than-life car sounds. And on the overrun there is a hiss very much like that emitted by the blow-by valve in a turbocharged car – this is when the two driving chains are tautened the other way. There's no ABS but ear to ear grin comes installed from the factory. Apart from its diabolical character it is so... well, Japanese. All of the switches, albeit with a totally different logic from later cars, can be operated easily, they jump into position with a reassuring click. 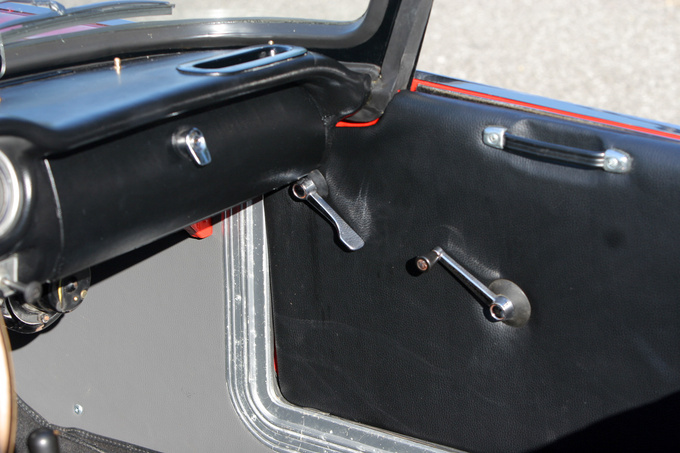 While canvas tops of contemporary roadsters were usually fiddly designs, this one is held close with three simple latches and it can be opened and closed with an ease nearing the MX-5's. Of course, it you want it watertight you have to close the studs along the edges but that's not a big deal. The temperature of the coolant stays level at all times, there's not a drop of oil coming from the engine and even after a hearty run it doesn't make any untoward mechanical noises. This is a Japanese car even if it's very old and tiny. If anybody dares to say that Japanese cars became good in the 90's, I'll send him a Sour Lemon badge and personally pin it up his bare chest. I've driven all kinds of cars from that age – Datsun 240Z's, a Toyota 2000 GT, a Suzuki van and now this little jewel. All these cars were surprisingly modern in feel, thoroughly executed, and you could see that there was no time and money spared to design them to the highest standards within the limitations of material use and engineering know-how of the day. Here, I'd also like to thank András for letting me borrow his little red devil without even being introduced to each other. It was better than a Christmas present. 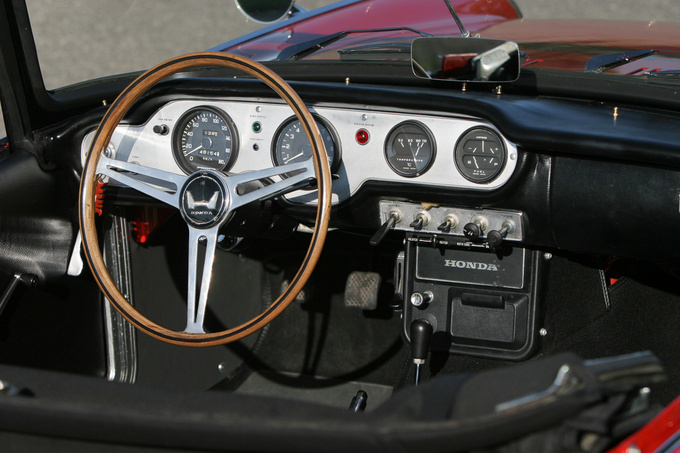 The first Honda car prototype was the X170 from 1959, a 360cc, air-cooled, V4 OHC engine built into a primitive ladder frame. Even though there was never a body planned for it the car already showed that from the first moment Honda was veering off the well-treaded path of car designers. They originally wanted to make the X170 into a car that could comply with the kei-car regulations. This is how the T360 and the S360 came into being. The latter was introduced at the 1962 Tokyo Motor Show but there was an experimental S500 already standing beside at the Honda stand. 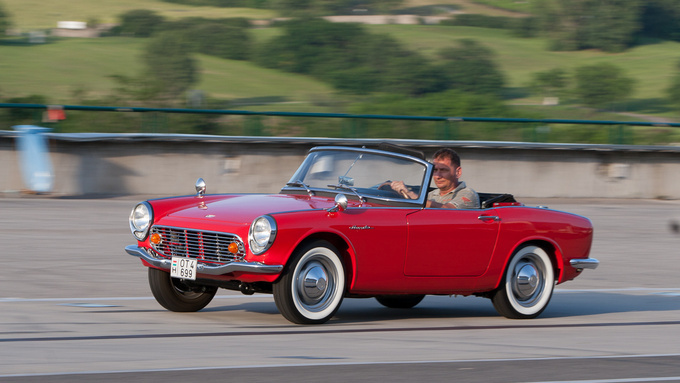 The reason: Honda couldn't get a kei-car approval for the S360, because it had too much power according to the authorities. But less power in a sports car would have equalled committing seppuku so Soichiro opted for something somewhat larger. In 1963 only the S500 made it to the show but its final body was longer and wider than the S360's. It was sold as a two-seater roadster and a coupe. 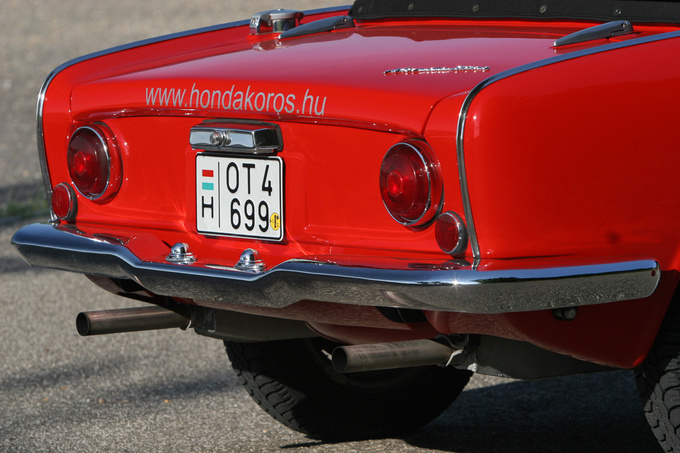 After just 1400 units it was replaced by the S600 having 57 PS and a top speed of 145kph in 1964. 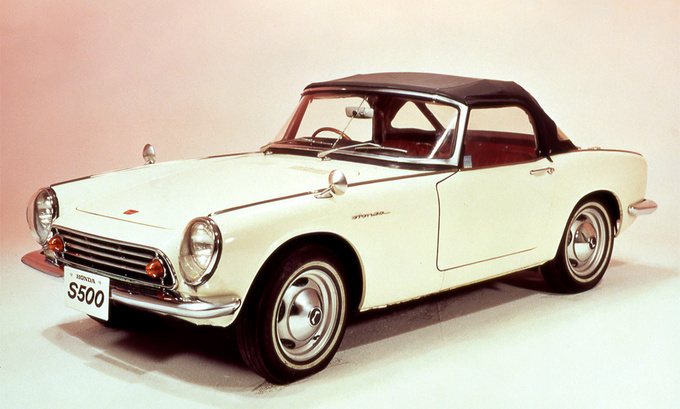 This one proved to be an instant hit and made it into the history books as Honda's first large-scale automobile. They enlarged the engine by a further 200cc in 1966 and that brings us to the last, S800 version which had a live axle at the rear. It was made until 1970. 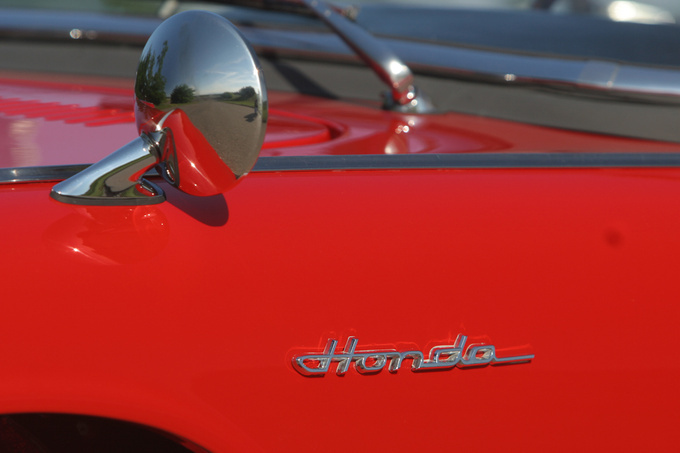 Production numbers of all three variants totaled 25,000, and it was by these very cars that Honda became a well-known maker of automobiles. So you hate the way your diesel Golf sounds, and envy the guy in the old Mustang? Here's something for you!